First on my pie-tinerary for the Chicago Pie Tour was Pleasant House Pub, home of the Royal Pies brand. For my first American pie it would have perhaps been typical to go for an Apple Pie or something similar. However, I happened to be quite close to the Pleasant House Pub which was billed as offering a British-inspired menu. Pleasant House had good reviews and I was confident I would be able to get a pie meeting our definition of a 'Proper Pie' so I decided to visit them for our first American pie review. Perhaps going to this pub which promised to be a 'home from home' would also be a way of easing myself in gently to the American pie experience? A short cycle from McCormick Place to Pilsen and I arrive at this beautiful cafe/bar/bakery/pie house combination. It really does seem to do it all so is likely to appeal to a broad range of people. One of the many great things about Pleasant House Pub is their long opening hours, 10:00 til 22:00, apparently there aren't many pie requests in the morning but they can do them (Is there a market for breakfast pies perhaps?). It would be good to see more places offering this kind of pie experience in the UK. Upon stepping inside I am greeted by this chap, Art Jackson (on the left), co-owner of the pub and creator of the Royal Pies. Trained as a classic chef, he has the all important combination of a flair for cooking and a passion for pies. Art's passion for British food was in part inspired by cooking with his Grandmother, his Father having come to the US from Yorkshire. When he was young his Grandmother said he should run a pie shop, something he didn't take seriously until later in life! After working in restaurants, Art and his wife Chelsea dreamed of owning their own restaurant so in 2011 they opened Pleasant House Bakery in nearby Bridgeport. This original incarnation of Pleasant House went down well with the local community. The unusual name comes from the house where Art's Father used to live in the Yorkshire countryside. However, it lacked it's own bar and was not air-conditioned, so, a few weeks before my visit they 'upgraded' to the new Pilsen location and changed the name to Pleasant House Pub with their experienced business partner Kevin Heisner becoming involved. The new venue is simple but appealing. I was particularly pleased to find that there was no kitsch British themed decor! In fact the British inspiration is subtle until you begin to look at the drinks or food on offer at which point the pies and scotch egg give it away. The pies are unchanged, still being branded as 'Royal Pies'. I grabbed a crisp Aspall's cider to help me cool down as I decided what pie to go for. The standard pies were the classic Steak & Ale and Chicken Balti as well as a Mushroom & Kale. There are also intriguing specials available with Ratatouille being on offer when I visited. I was torn, but decided to go for the Steak & Ale as this seems to be a pie which often scores well on Pierate. It was $8.50 with the option to 'crown' your pie with mash and gravy for another $2.50. I opted for the gravy on the side but couldn't resist crowning the pie with mash. I initially felt this was a bit expensive for a small meal (over £8) but it was table service and a nice restaurant setting so I decided actually the price was quite reasonable even with the crap exchange rate (and I don't want to hold the political whims of the British public against this pie). This is the dish that arrived and I think it looks rather fetching even though the mash does obscure the pie somewhat. I was pleased to see the pie was a quite tall, a decent size and had a nice golden crust. They had even achieved what most pies fail with, in that the sides and base had also been cooked well whereas all too often the sides and base can be soggy. Slicing the pie open revealed plenty of steak and quite a bit of carrot. The pastry was ideal in that it was crunchy on the outside and soft in the middle. The chunks of meat were soft and had a nice flavour. The flavours were familiar but also a bit different and I say that having eaten a lot of Steak & Ale pies in my time. What made this pie stand out was the tangy, almost fruity flavours to the sauce. It reminded me of Worcestershire Sauce and I suspected it may have been flavoured with a similar sauce called 'Henderson's Relish' which Art had noted they imported specially to Pleasant House Pub. Apparently it is a staple in Sheffield and South Yorkshire but those from outside that region are unlikely to have heard of it (like myself). There was also a real meaty flavour to this pie and overall I thought the flavours worked very well. It was nice that it did something a bit different to the standard Steak & Ale. The carrot was soft and added a sweetness to the flavour, I thought it was nice to have some veg but would have chosen it to be less soft personally. The gravy was unnecessary as there was enough sauce with the pie but as is the case back home it is provided regardless. If I had to criticise the pie, some of the pastry was a little too thick in places for me but I think this is difficult to get perfect when you are trying to make a pie which has rigidity like this one did. Whilst the pie was a good size, had I been more hungry I but suspect I might have looked at the plate and thought it could have benefited from more mash or peas on the side. I had one main regret from my trip to Pleasant House Pub, why on Earth did I only have one pie? I will always wonder what the Chicken Balti would have been like, with Art citing it as his favourite. I should have at least taken a pork pie away with me, but alas, at least Pleasant House Pub left me wanting more. I hope that their new neighbours in Chicago get the British inspired menu which is quite niche in these parts, with Art feeling that British food is unrepresented considering the wealth of other international cuisine available. Many thanks to Art for taking the time to chat to me. 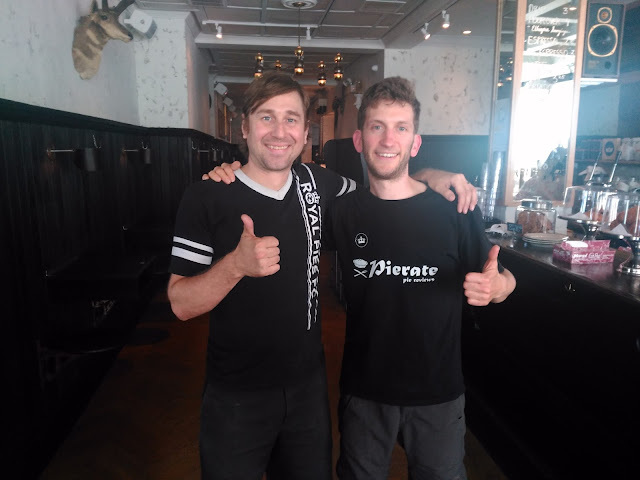 Was really great to learn that he was a fan of Pierate and I am pleased to announce that we are now fans of his pies which now carry Pierate Highly Recommended status! A great pie which would go down well in any gourmet pie house back in Britain.